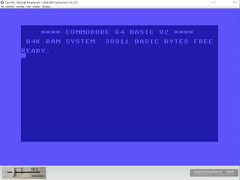 Z64K is a pixel exact emulation of the Commodore 128, Commodore 64, VIC 20 and Atari 2600 written entirely in Java. The emulators should run on any platform with an updated Java Runtime environment. Recent changes: Improvements for the TestBench (drive and support for VICE & HOXS64), icons and screenshots.